More than thirty years ago, the Keiser Family began training world class athletes. Research has shown that power is the key to human performance whether you are an elite athlete or a weekend warrior. In order to make training more efficient, the Triple Trainer was designed to develop the two main components of human movement: force and speed. Thanks to Keiser’s Pneumatic Technology (air pressure) our clients can train at any speed and at any given resistance. Today’s gyms are incorporating areas dedicated to cable and functional training protocols, where multiple machines are required to service the needs of customers. The Keiser Infinity Triple Trainer condenses all of those cable exercises with precision and efficiency to boost rotational stability and power. 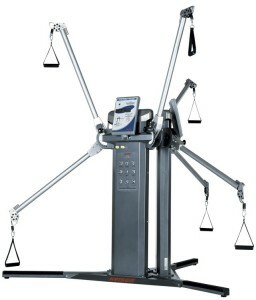 This equipment performs an unlimited number of exercises, ensuring maximum versatility. Even exercises requiring a great deal of agility, like those used in sport specific training, can be done with ease. All body shapes and sizes are also comfortable using this equipment. By utilizing the power of Keiser’s free moving air pressure, this equipment allows users to safely increase power output as speed increases. This allows for intense functional workouts with zero shock load to muscles, connective tissues and joints.